Physical Test Date 21-01-2015 Thi Sharu Thanar Chhe. Physical Test Gujarat State Na Total 16 Ground Par Jojanar Chhe. 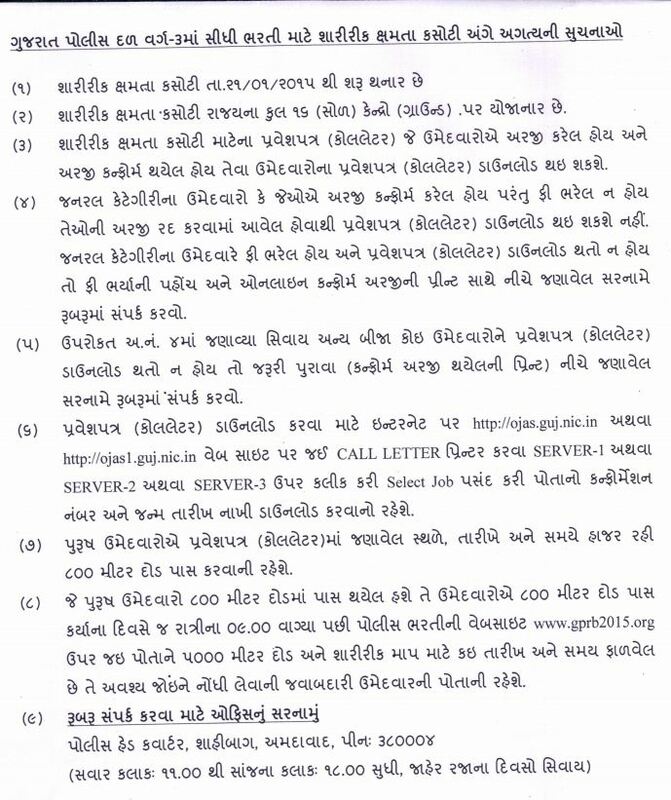 Je Umedvaro Ni Application Confirm Thai Chhe Te On line Call Letter Download Kari Shakshe. Call Letter Ma Janavel Address, Date and Time Par Hajar Rahi 800 Metre Run Pass Karvani Raheshe. Je Candidate 800 Metre Run Ma Pass Thayel Hashe Te Umedvaro ae Te Divase 9.00 pm Pachhi Police Bharti Board Ni Website www.gprb2015.org Par Jai Potane 5000 Metre Run and Physical Map Mate Kai Date and Time Falvel CHhe Te Avashy Joine Nondhi Levanu Raheshe. je ground par 800m hase te j 5000m running pan hase?